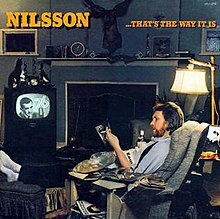 ...That's the Way It Is is the thirteenth album by American singer Harry Nilsson, released in 1976 on RCA Records. Aside from two original songs, the album consists of cover tunes. The songs include "That Is All", written by George Harrison and originally released on Living in the Material World in 1973; America's "I Need You", from their eponymous 1971 album; Randy Newman's "Sail Away", from his 1972 album of the same name; and the Heartbeats' "A Thousand Miles Away". Harrison's song was recorded twice by Nilsson, to open and close the album. Another cover version on ...That's the Way It Is, the calypso "Zombie Jamboree", had previously been recorded by Lord Intruder, Kingston Trio and Harry Belafonte, among others. Nilsson's medley of the 1963 Doris Troy hit "Just One Look" and Van McCoy's "Baby I'm Yours" was performed as a duet with singer Lynda Laurence. The latter, formerly of the Supremes, was the wife of Nilsson's producer, Trevor Lawrence. ^ "...That's the Way It Is Info". AllMusic. Retrieved 26 April 2011. ^ Strong, Martin C. (2006). The Essential Rock Discography. Edinburgh, UK: Canongate. pp. 758–59. ISBN 978-1-84195-827-9. ^ Randall, Mac; Brackett, Nathan; Hoard, Christian (eds) (2004). The New Rolling Stone Album Guide (4th edn). New York, NY: Simon & Schuster. p. 586. ISBN 0-7432-0169-8. This 1970s pop album–related article is a stub. You can help Wikipedia by expanding it.